Businesses of all sizes are recognizing the powerful effect that data analysis can have on decision-making, resulting in the increasing deployment of Business Intelligence (BI) applications and solutions. 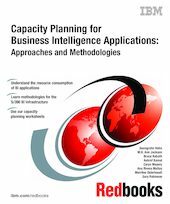 This IBM Redbooks publication contains approaches and methodologies that help you do capacity planning for the system resources that support BI applications accessing DB2 on OS/390. This book addresses capacity planning for the S/390 Business Intelligence infrastructure, which includes processors, memory, I/O subsystems and DASD; it does not address capacity planning of network or non-S/390 hardware platforms.